You probably have seen this guy on HGTV over the last few years turning trash into treasure on the hit show, Flip or Flop. But what does Tarek do when he’s not flipping homes? At any given time he could be leading one of his real estate seminars, running his real estate business or spending time with his two little ones. However this past weekend, he decided to spend some time with us in the Santa Ynez Valley. 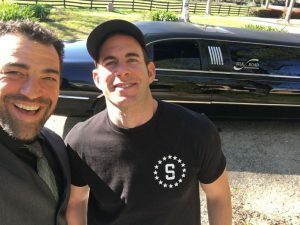 Tarek came into town over the weekend, and we at Silk Road Transportation had the pleasure of showing him all of the great things in Santa Barbara Wine Country. Tarek arrived at the Santa Ynez Airport Saturday morning where we picked him up, and made our way toward wine country for a day filled with wine tasting tours and fun. We also had the pleasure of taking him back to the airport the next day before his departure. He was also nice enough to give us a shoutout! We specialize in Door-to-door airport transportation, Wine tasting tours, Special event transportation and more. If you’re ever in the Solvang area, be sure to get in touch with us, we would be happy to serve you!